Valve boss Gabe Newell has made it clear that he thinks Gordon Freeman is fine the way he is. 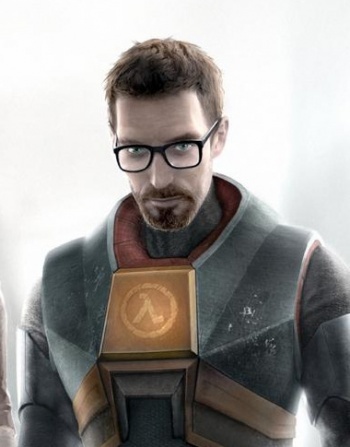 In a world where action game protagonists are defined by the likes of Nathan Drake and Marcus Fenix; Half-Life's Gordon Freeman is something of an anomaly. He never appears in cutscenes, never wisecracks, and indeed, never actually speaks at all. When asked if future instalments of the series might see Freeman being brought more in line with the typical videogame hero and make him more than an arm with a crowbar, Valve's Gabe Newell shot the idea down pretty fast, saying: "We haven't had a reason to change that. Most of what I've seen to date has been gimmicky and is entertaining for just a minute or so." The question of whether or not Freeman would speak was also raised, and what Newell had to say was interesting: "We're not philosophically opposed to this, but we don't have any good reasons to do it. Right now making your companions more interesting and compelling seems a more fruitful avenue to explore."